The manchineel tree (Hippomane mancinella) is a species of flowering plant in the spurge family (Euphorbiaceae). It is native to tropical southern North America and northern South America. The name "manchineel" (sometimes written "manchioneel") as well as the specific epithet mancinella is from Spanish manzanilla ("little apple"), from the superficial resemblance of its fruit and leaves to those of an apple tree. A present-day Spanish name is manzanilla de la muerte, "little apple of death". This refers to the fact that manchineel is one of the most dangerous trees in the world. 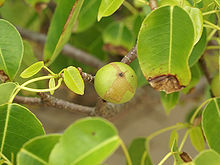 Manchineel is also known as the beach apple. Manchineel is native to the Caribbean, the U.S. state of Florida, The Bahamas, Mexico, Central America, and northern South America. The manchineel tree can be found on coastal beaches and in brackish swamps where it grows among mangroves. It provides excellent natural windbreaks and its roots stabilize the sand, thus helping to prevent beach erosion. Hippomane mancinella, the evergreen manchineel tree, grows up to 15 metres (49 ft) tall. It has reddish-greyish bark, small greenish-yellow flowers, and shiny green leaves. The leaves are simple, alternate, very finely serrated or toothed, and 5–10 cm (2–4 in) long. Spikes of small greenish flowers are followed by fruits, which are similar in appearance to an apple, are green or greenish-yellow when ripe. The fruit is poisonous, as is every other part of the tree. All parts of the tree contain strong toxins, some unidentified. Its milky white sap contains phorbol and other skin irritants, producing strong allergic contact dermatitis. Standing beneath the tree during rain will cause blistering of the skin from mere contact with this liquid (even a small drop of rain with the milky substance in it will cause the skin to blister). The sap has also been known to damage the paint on cars. Burning the tree may cause ocular injuries if the smoke reaches the eyes. Contact with its milky sap (latex) produces bullous dermatitis, acute keratoconjunctivitis and possibly large corneal epithelial defects. The fruit is possibly fatal if eaten; however, "fatalities from ingestion are not reported in the modern literature" and "ingestion may produce severe gastroenteritis with bleeding, shock, bacterial superinfection, and the potential for airway compromise due to edema. Patients with a history of ingestion and either oropharyngeal burns or gastrointestinal symptoms should be evaluated for admission into hospital. Care is supportive." When ingested, the fruit is reportedly "pleasantly sweet" at first, with a subsequent "strange peppery feeling ..., gradually progress[ing] to a burning, tearing sensation and tightness of the throat". Symptoms continue to worsen until the patient can "barely swallow solid food because of the excruciating pain and the feeling of a huge obstructing pharyngeal lump". In some parts of its range, many trees carry a warning sign (for example on Curaçao), while others are marked with a red "X" on the trunk to indicate danger. In the French Antilles the trees are often marked with a painted red band a few feet above the ground. On Bonaire, however, trees are unmarked. Although the plant is toxic to many birds and other animals, the black-spined iguana (Ctenosaura similis) is known to eat the fruit and even live among the limbs of the tree. The tree contains 12-deoxy-5-hydroxyphorbol-6-gamma-7-alpha-oxide, hippomanins, mancinellin, and sapogenin, phloracetophenone-2,4-dimethylether is present in the leaves, while the fruits possess physostigmine. A poultice of arrowroot (Maranta arundinacea) was used by the Arawak and Taíno as an antidote against such poisons. The Caribs were also known to poison the water supply of their enemies with the leaves. Spanish explorer Juan Ponce de León died shortly after an injury incurred in battle with the Calusa in Florida—being struck by an arrow that had been poisoned with manchineel sap. Despite the inherent dangers associated with handling it, the tree has been used as a source of timber by Caribbean carpenters for centuries. It must be cut and left to dry in the sun to remove the sap. A gum can be produced from the bark which reportedly treats edema, while the dried fruits have been used as a diuretic. The manchineel tree is listed as an endangered species in Florida. William Ellis, ship's surgeon for James Cook on his third and final voyage, wrote: "On the fourth, a party of men were sent to cut wood, as the island apparently afforded plenty of that article; amongst other trees they unluckily cut down several of the manchineel, the juice of which getting into their eyes, rendered them blind for several days." Alexandre Exquemelin, author of the book The Buccaneers of America wrote of his experience with the "tree called mancanilla, or dwarf-apple-tree" when in Hispaniola (modern day Haiti/Dominican Republic): "One day being hugely tormented with mosquitoes or gnats, and as yet unacquainted with the nature of this tree, I cut a branch thereof, to serve me instead of a fan, but all my face swelled the next day and filled with blisters, as if it were burnt to such a degree that I was blind for three days." Nicholas Cresswell, in his journal entry for Friday, September 16, 1774, mentions: "The Mangeneel Apple has the smell and appearance of an English Apple, but small, grows on large trees, generally along the Seashore. They are rank poison. I am told that one apple is sufficient to kill 20 people. This poison is of such a malignant nature that a single drop of rain or dew that falls from the tree upon your skin will immediately raise a blister. Neither Fruit or Wood is of any use, that I can learn." In Giacomo Meyerbeer's opera L'Africaine (1865), the heroine Sélika dies by inhaling the perfume of the poisonous blossoms of the manchineel tree. In the story "The Beckoning Hand" (in the 1887 collection of that name) by Grant Allen, manchineel is used in a cigarette to poison the smoke. The tree is recorded as the world's most dangerous tree by the Guinness World Records. ^ a b Strickland, Nicola H (August 12, 2000). "Eating a manchineel "beach apple"". BMJ : British Medical Journal. 321 (7258): 428. doi:10.1136/bmj.321.7258.428. ISSN 0959-8138. PMC 1127797. PMID 10938053. ^ "Hippomane mancinella". Germplasm Resources Information Network (GRIN). Agricultural Research Service (ARS), United States Department of Agriculture (USDA). Retrieved 2009-01-27. ^ a b Friedman, Michael G. Andreu and Melissa H. (November 24, 2015). "Hippomane mancinella, Manchineel". edis.ifas.ufl.edu. School of Forest Resources and Conservation, Institute of Food and Agricultural Sciences, University of Florida. Retrieved 2015-11-29. ^ Nellis, David W. (1997). Poisonous Plants and Animals of Florida and the Caribbean. Pineapple Press Inc. p. 173. ISBN 978-1-56164-111-6. ^ a b McLendon, Russell. "Why manchineel might be Earth's most dangerous tree". Mother Nature Network. Narrative Content Group. Retrieved 2015-11-29. ^ a b Janiskee, Bob (April 24, 2009). "National Park Mystery Plant 2: There's Good Reason They Call This Thing "the Death Apple"". Nationalparkstraveler.com. National Park Advocates LLC. Retrieved November 29, 2015. ^ Pitts, J F; Barker, N H; Gibbons, D C; Jay, J L (May 1, 1993). "Manchineel keratoconjunctivitis". The British Journal of Ophthalmology. 77 (5): 284–288. doi:10.1136/bjo.77.5.284. ISSN 0007-1161. PMC 504506. PMID 8318464. ^ Bygbjerg I.C. and H.K. Johansen (1991): "Manchineel poisoning complicated by streptococcal pharyngitis and impetigo". Ugeskr. Laeger 154(1), 27–28. ^ Frohne, Dietrich; Alford, Hans Jürgen Pfänder (2005). Poisonous plants: a handbook for doctors, pharmacists, toxicologists, biologists and veterinarians. Translated by Inge (2nd ed.). Portland: Timber Press. ISBN 0881927503. ^ "Hippomane mancinella". Dr. Duke's Phytochemical and Ethnobotanical Databases. United States Department of Agriculture. Archived from the original on 2004-11-10. Retrieved 2009-01-27. ^ Jones, David E (2007). Poison Arrows: North American Indian Hunting and Warfare. University of Texas Press. p. 29. ISBN 978-0-292-71428-1. Retrieved 2009-01-23. ^ Grunwald, Michael (2007). "Chapter 2: The Intruders". The Swamp. Simon & Schuster. p. 25. ISBN 978-0-7432-5107-5. ^ "Hippomane mancinella". Atlas of Florida Vascular Plants. Plantatlas.org. Retrieved 2009-01-23. ^ An Authentic Narrative of a Voyage Performed by Captain Cook and Captain Clerke, in His Majesty's Ships Resolution and Discovery, During Years 1776, 1777, 1778, 1779, and 1780: In Search of a Northwest Passage Between the Continents of Asia and America, Including a Faithful Account of All Their Discoveries, and the Unfortunate Death of Captain Cook. G. Robinson, J. Sewell and J. Debrett. 1783. p. 60. ^ Cresswell, Nicholas. The Journal of Nicholas Cresswell: 1774–1777. ^ "Gallica: L'africaine : opéra en 5 actes / par Eugène Scribe ; musique de Meyerbeer. 1924". Bibliothèque nationale de France. Retrieved 2016-06-19. ^ Allen, Grant (1887). The Beckoning Hand, and Other Stories. Auckland: The Floating Press. ^ White, Susan (2014). "Chapter 14: Nicholas Ray's wilderness films: word, law, and landscape". In Rybin, Steven; Scheibel, Will (eds.). Lonely places, dangerous ground: Nicholas Ray in American cinema. Albany, New York, USA: State University of New York (SUNY) Press. ISBN 978-1-4384-4981-4. ^ "Most dangerous tree". Guinness World Records. Retrieved 2015-11-29. Wikimedia Commons has media related to Hippomane mancinella.